From its founding in Sydney ten years ago, Deus Ex Machina, the motorcycle, surf and clothing brand has expanded not only globally, but also exponentially. And from their Venice location, Woolie brings a distinctive old-school ‘Cali’ style to their builds. Growing up in Marin County in the Frisco Bay area, he was surrounded by cars and bikes from a young age – something which probably explains why he was capable of rebuilding a Briggs & Stratton engine at just nine years old. And with links to the movie industry, a racing background and a back catalogue of big builds, MV might have interviewed many big name builders for the project but Woolie was always the clear choice. He’s also old enough to understand the brand’s racing heritage, too. 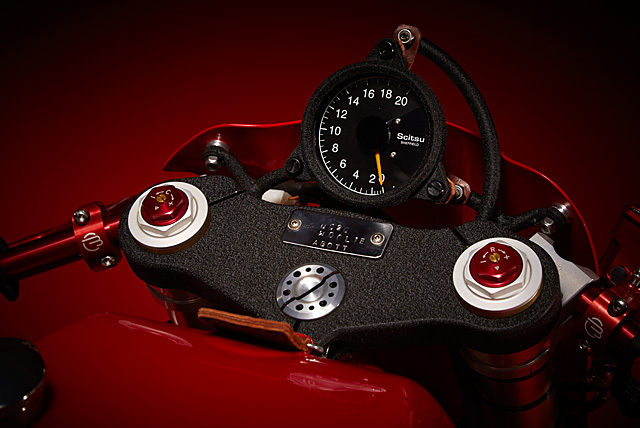 “MV’s were not only the best looking motorcycles ever built, but they were also the ones to beat because they had the most amazing motors and a secret weapon — their chief tinsmith Primo Selotti,” says Woolie, recalling a conversation he had with fellow shaper Evan Wilcox. 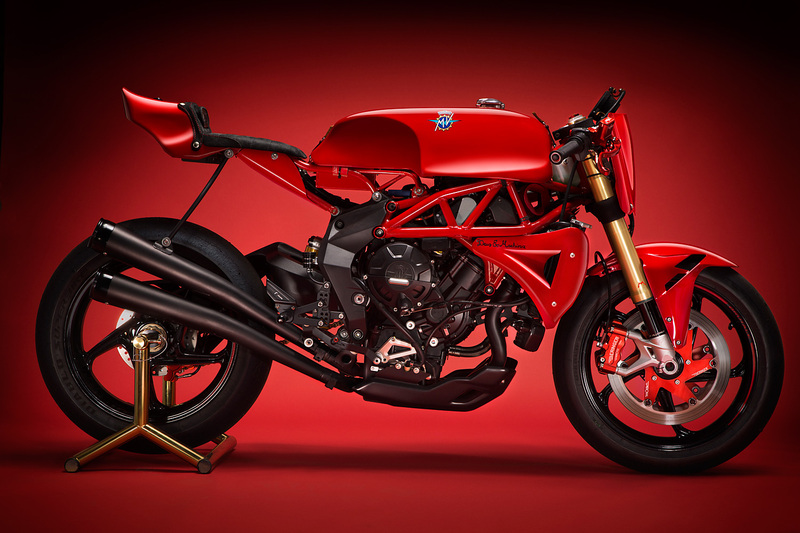 He was insistent the bike be a true racing tribute: no headlight, no blinkers and no compromises, and with a brand new Brutale RR up on the bench it was time to get down to business. The front tubular trellis frame remains in place, but the subframe is gone and a totally new item, fabricated in-house from quality chrome-moly, forms the bespoke rear support. Much of the electronic hardware is affixed to this new subframe, but its primary role is supporting the impressive tail section. A modern interpretation of the old design, the tail unit is like the proverbial Devil’s head, hand-crafted from aluminium with flowing lines to put the fear of God into all who would challenge her. 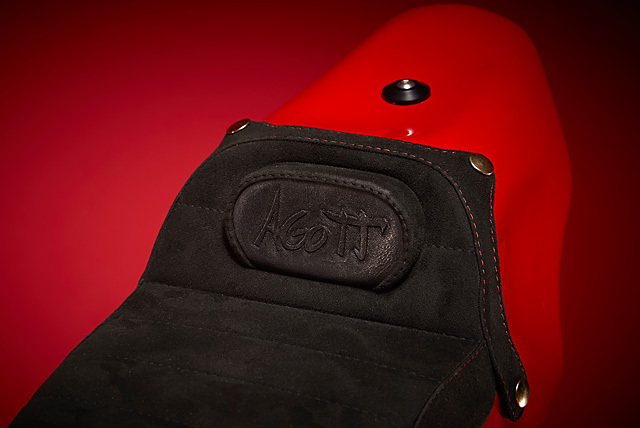 To top it off, the aluminium base holds a custom seat with ‘AgoTT’ embossed in the hump support and old school press buttons to help secure it to the rear section. 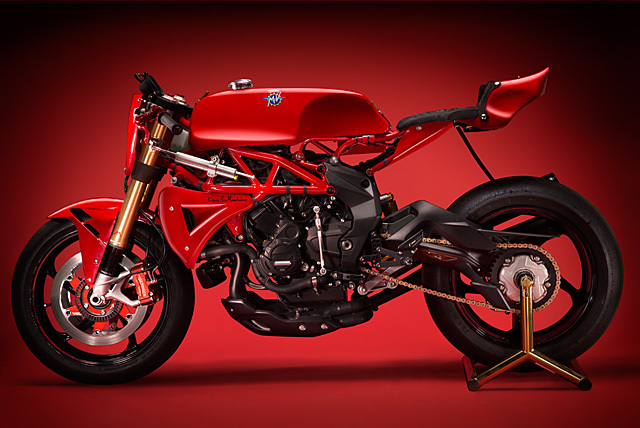 But to truly capture the MV feel of the classic TT era, it was always going to be the tank that would provide the most challenges and be the vital component of the build. And for a man who once skipped class to hang out in the metal shop, Woolie was born for the task of replicating the work of his predecessors “Selotti was from the airplane industry and was revolutionary in his gas tank shapes that not only looked great, but were super aerodynamic with ergonomics to fit the rider. 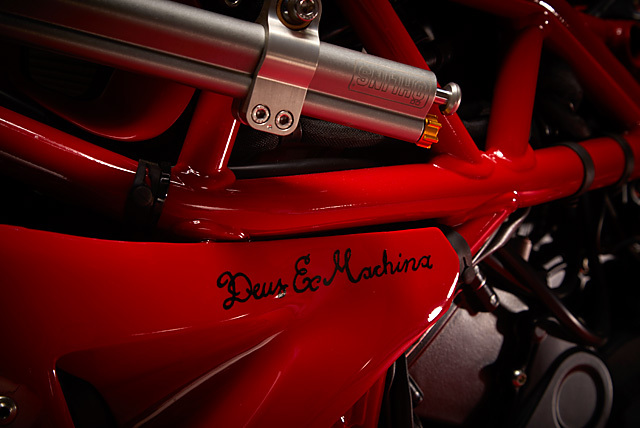 They were only meant to go fast.” Shaped from seven individual pieces of aluminium and with all the challenges of contouring to a modern frame and creating the negative curves, this is without a doubt the hardest tank Deus has ever built. But what a result. The bodywork is completed with custom radiator shrouds featuring smooth NACA ducts and a front number plate, while the stock front fender has been filled for a smooth finish. 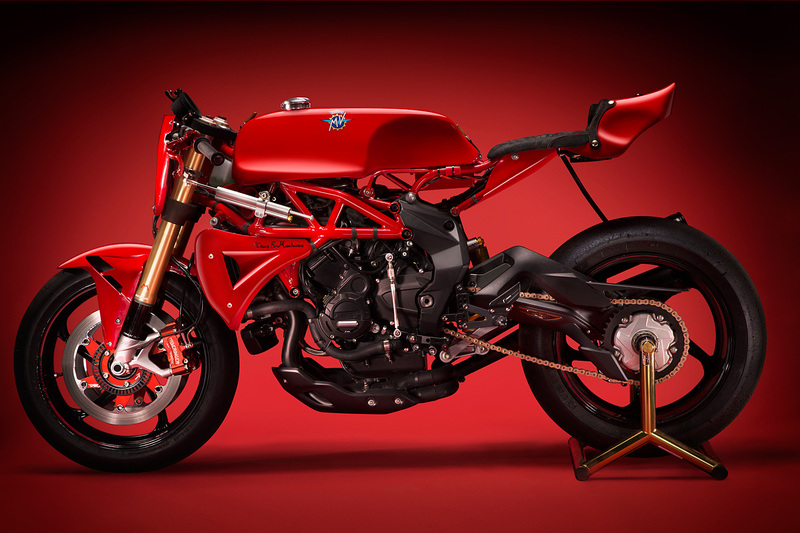 Then it was time to lay down that bloody glorious MV Agusta red. 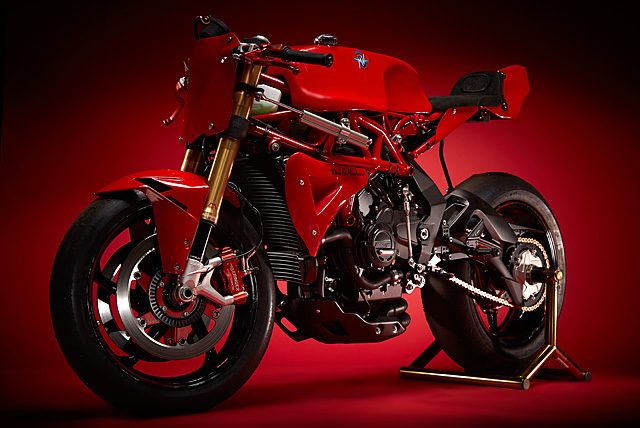 If three means perfection, then a 798cc triple fitted to the RR version of the Brutale backs it up. Many would have you believe that it is simply the best three cylinder engine ever built for the street. And who are we to disagree? When Gary Johnson rode the 675 version at the Isle of Man TT in 2013, spectators would run to the fences to catch a glimpse of it in full flight and the experienced commentators giggled with joy at its beautiful, orchestral sounds. But add more cubes, a total of six injectors, a bonkers 13.3:1 compression and a counter rotating crank and you get 140 of the finest horses around galloping their way to a 13,200 rpm redline. 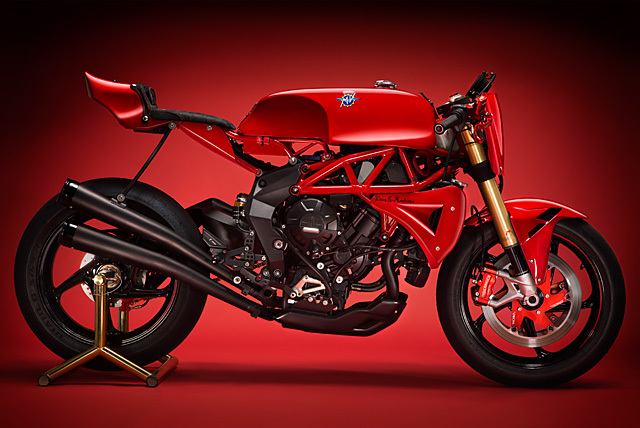 To extract that wicked sound, unleash some extra ponies and recreate the look of the stunning exhausts fitted to the original MV Agusta 350-4 race bikes, Woolie sourced 27 inch megaphones from Cone Engineering and SPD tubing. Then in his small workshop he hand-built a new exhaust system so beautiful, it alone is a piece of art worthy of a museum display. It’s then been topped it off with end caps from Cam at Roland Sands Design. 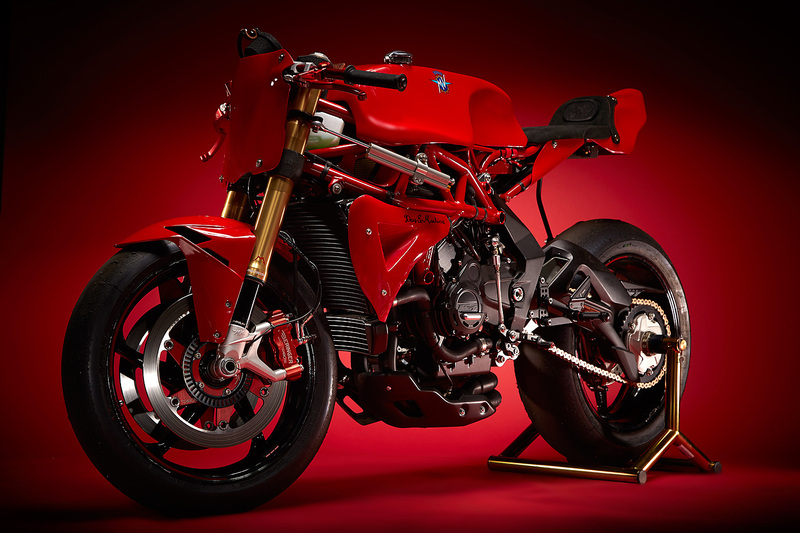 The guys at MV then re-tuned the Eldor EM2.0 ECU with ride by wire technology, and the AgoTT has a red-hot motor to light a candle under even the most speed-jaded backsides. Of course you can have all the power in the world, but as Woolie was creating a track focused machine, that means getting that power to the ground and holding big speed through the corners. Without a doubt, the RR is up to the task and with MV fitting all-new aluminium Marzocchi 43mm forks, the front end gets off to a flying start. 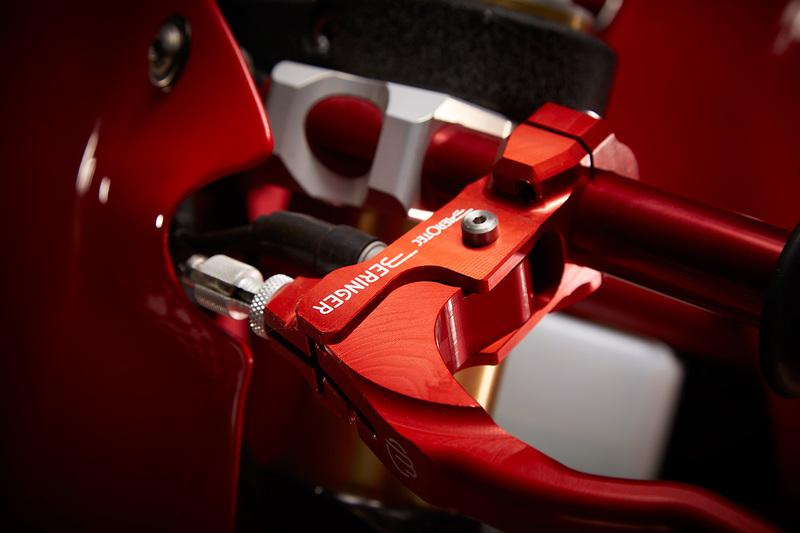 The DLC coated forks are held in place by new custom triple clamps made by Durelle racing, who have a reputation for beautifully machined, lightweight parts. Out back, the factory engineers had seen fit to add an all-new Showa rear shock, but only the best would do for Woolie and we all know what that means. Ohlins. With the giant Swedish firm not yet producing a unit for the RR, Ohlins USA hand-built a completely custom shock especially for AgoTT. Seriously. The factory CRC steering damper keeps the lightweight machine from shaking its head, but the new tank meant relocation to the side of the frame, so it made sense to switch it out for an even better Ohlins piece. To make the most of the handling, only one tyre would ever do; Pirelli Diablo Superbike slicks fitted to the gorgeous factory alloy wheels. And while you’d think that the factory Brembo brakes on board would do just fine, Woolie has a thing for the brilliant products from French firm Beringer and their full brake package is fitted front and back. 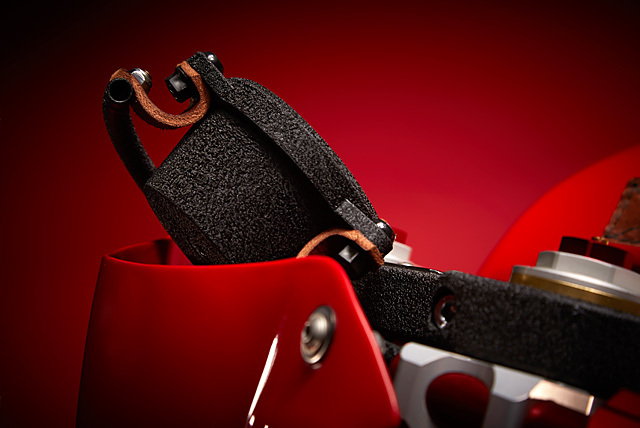 The cast iron rotors and brilliantly machined calipers in red are their specialty, and you better believe they work. “This system in incredible to say the least,” say Woolie. Mounted up on the new LSL clip-ons from Spiegler, the Beringer levers look as though they’ve been taken straight from the MotoGP paddock. You’d shudder to think what they’re worth. Then it was back to the Italians for the foot controls, and a set of fully adjustable Rizoma rear sets makes clicking through the MV’s quick shifter an absolute breeza. 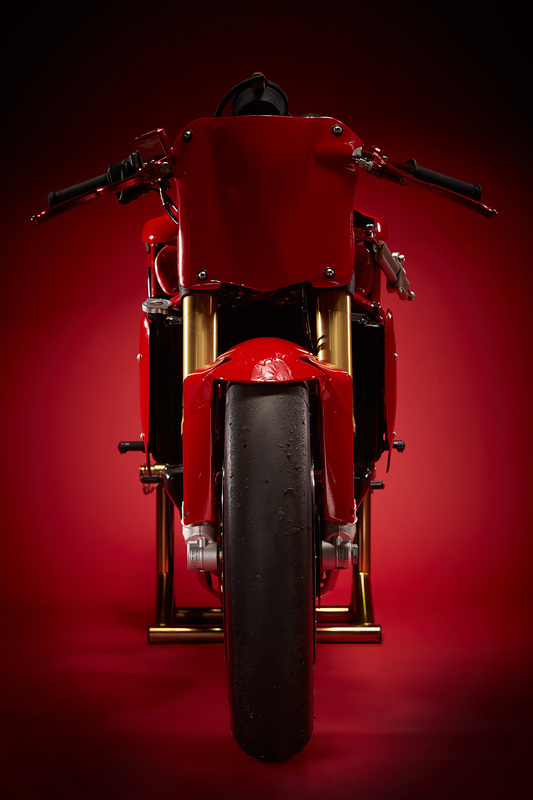 The finishing touches to the build are all class and really do show Woolie’s dedication to bringing the personality of the classic race bike to life. 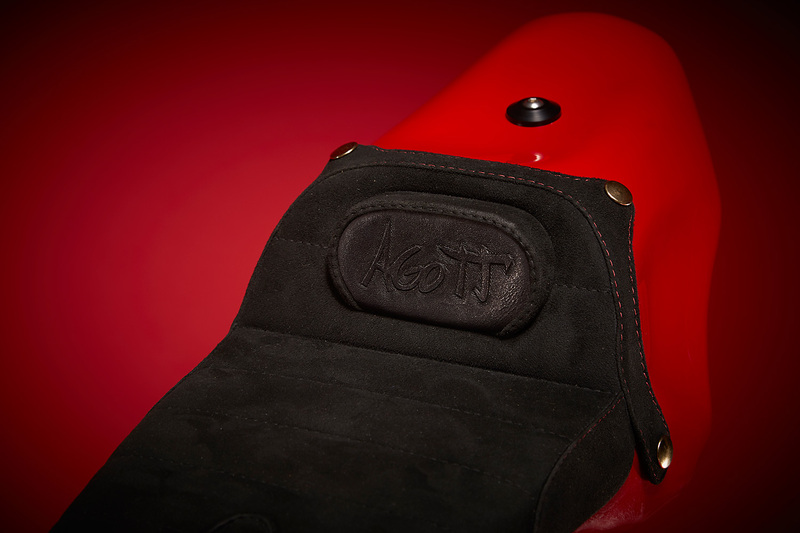 The fuel tank and single Scitsu tachometer are secured with beautiful leather straps, crinkle paint adorns the upper triple clamp and instrument surround. There are lashing of red wherever the eye can see, and the Monza cap tops it all off while finally finding the new home it deserves. “The racing slicks are properly gummed up from some track time at Laguna Seca and Willow Springs raceway; it really feels like a Grand Prix bike, laser-straight and very responsive,” says Woolie. “While testing it on the track, I didn’t want to go back to the pits,” he adds. We can believe that. It’s almost impossible to take your eyes off the killer combination of a historic motorcycle company, the graphic style that is Deus Ex Machina and the work of a true craftsman. Omne trium perfectum? You better believe it. For those in L.A. this weekend, the release party is this Sunday at Deus Venice, kicking off at 9am.